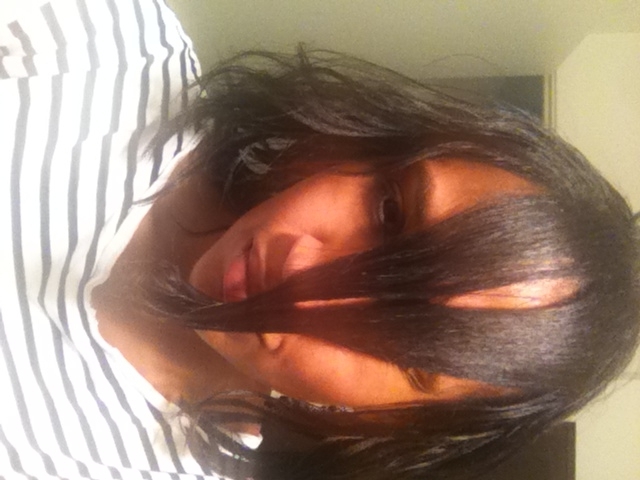 January | 2013 | hair, there and everywhere! Wash Day and I am Scraggly End BSL! Greetings folks! Hope everyone had a great weekend! Today was my Wash Day. It was most uneventful! I pre-pooed with some hot oil to the scalp and some Alberto V-05 on the length, paying close attention to any breakage among the ends. There was very few ends, so I was extremely pleased. 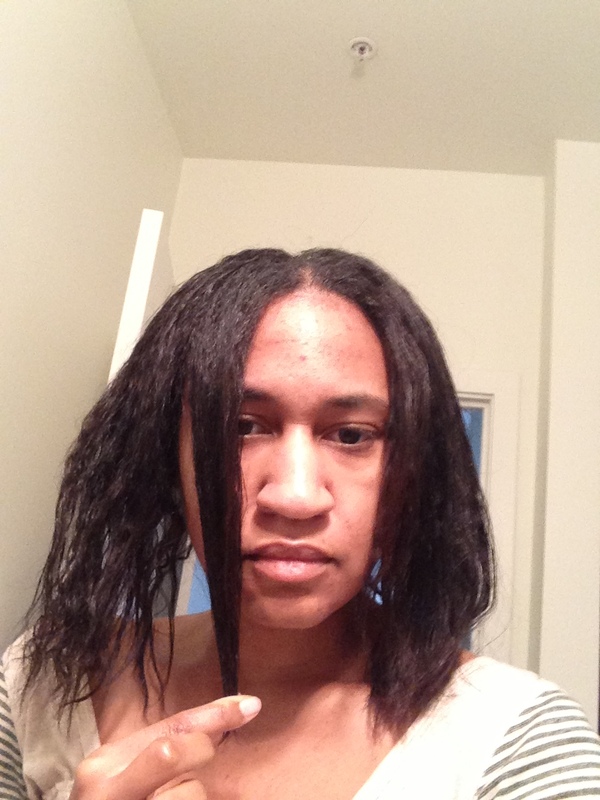 I also took the chance of smoothing my hair down with the conditioner to do a length check. My hair has been growing like mad the last few weeks, as my new growth measures almost 2 inches in the front (and closer to the normal growth rate in the back). I stretched my left back section down (as you know I touch my right side on when absolutely necessary or risk every piece of that section ending up in my hand!) and whatcha know … a few scraggly strands hit my bra strap line, although I am sure that the ends promptly broke off as soon as I stopped stretching it. LOL! I had my Mckayla Maroney I-am-not-impressed face! I know that I am not BSL, but I am sure once I relax, there will be about 10 hairs there. Now I know some people would claim that, but nawl … I am not going to do that! I washed my hair with Alberto V-05 Strawberries and Cream shampoo as a light clarifying poo. I followed up with my Alterna Caviar shampoo and then put in my Alterna Rx Thermal Oil for 5 minutes. I then put in my Alterna conditioner in with my turban and let it steam in while I showered. I decided to deep condition with the Ion Extreme Moisture and EVOO instead of my MegaSilk just to see how my hair reacted. I sat under the dryer for 45 minutes reading the most hilarious website ever (I do not know how I stumbled across this website, but I am glad I did because it is the pure bizness! http://www.awesomelyluvvie.com/). I did a final rinse with Roux. 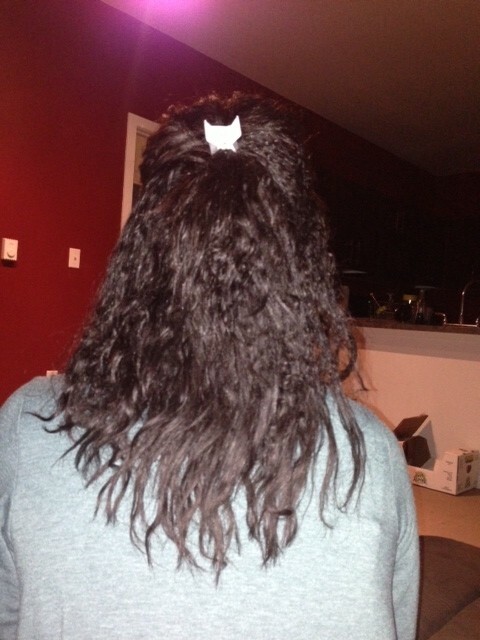 Now that I am about 11 weeks post, my hair is not detangling as easy as I would like. I had to detangle in smaller sections just to keep my sanity! I used my Alterna Photo Defense (concentrating heavily on the ends), Roux 619 and Alterna Texture as my leave-ins. I sealed my hair with a combination of kukui nut oil and aloe vera juice to provide a good seal. Instead of sitting under the dryer, I sat in front of my beloved heater as I feel the results are better when I did so. Well ta ta for now! 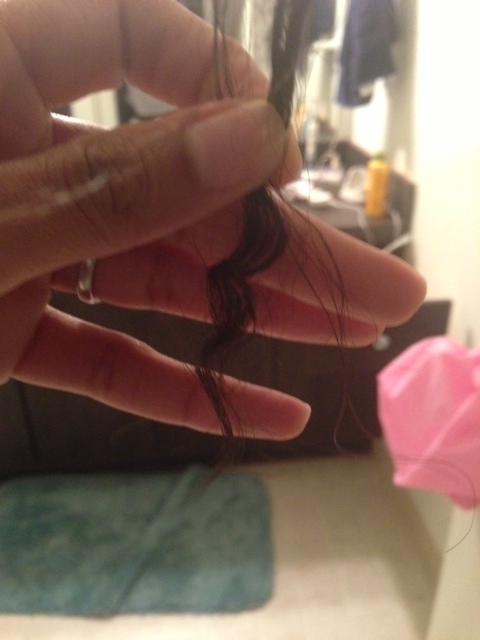 Here is my air dried hair and I took a picture of one perfectly formed curl! Shoooo … makes me think I am natural!!! LOL! Time to Revisit Aloe Vera Juice and ACV Rinses! Greetings all! Last night I could not help it … I had to dust the back part of my hair. That problem area of my hair had a few broken ends and I said “Screw it!” and went to the freezer where I keep my shears and took about 1/4 inch off. I am at the end of my rope when it comes to these dry, frayed ends! I do everything I am supposed to do … I M&S in sections daily! I deep condition with heat most weeks. I co-wash. I try to avoid direct heat styling tools. I protective style 90% of the time. I am doing all the right things (or so I think), but I am not seeing the results that I want when it comes to healthier ends! Of course it is not the dry ends debacle of last year when I had a pile of dry ends on a sheet of paper, but still … I am ready for the day when I don’t have to worry about any of them snapping off. I know that may not be realistic … but I know I can do better than what I am doing now! My ends are very porous, as I discovered in July. The longest parts of my hair are probably going on three years old and I definitely was not on a HHJ when they were in their young days … so now they are just beat up old ends with heat damage and little ability to retain moisture. I think I am going to try some remedies that I abandoned long ago (for reasons unknown … maybe I thought I had it figured out??) that will help pH balance my hair a bit more than the 4.5 pH of Roux Porosity Control. My next wash (or co-wash) day, I think I will do a final rinse with Apple Cider Vinegar Rinses (ACV), which has a pH of 3. Starting this morning, I started misting my hair (paying close attention to my ends) with my water spritz, my Alterna moisturizer and a bit of Aloe Vera Juice (AVJ), which has a pH of 4 to 6 depending on the brand. It is apparent that I need products that are slightly more acidic to shut the cuticle and retain moisture because what I am doing now isn’t cutting it. I will update in a few days to let you know how my hair is doing!!! Greetings! I wanted to do a length-check update for my hair in the front! It is still in chin length territory, but it definitely has grown! Unfortunately, this part of my hair is the first place I cut when I do my dusting since I can see it the best, so yeah, it definitely is taking a lot longer for me to see results compared to the back of my hair. I have only dusted once this relaxer cycle and I don’t plan on doing it before my relaxer. This part of my hair is doing well and does not appear to have any dry ends at the moment, so even if I have to do an unexpected dusting, I will just ignore this part! My goal for this part of my hair is to be shoulder length by the end of the year (while the front part of my hair is BSL+??). I really hate the fact that I had a cut with my hair with the front part so short, but there is nothing I can do about it now but let it grow. So here a look at my “bangs” progression from August 2011 to now! 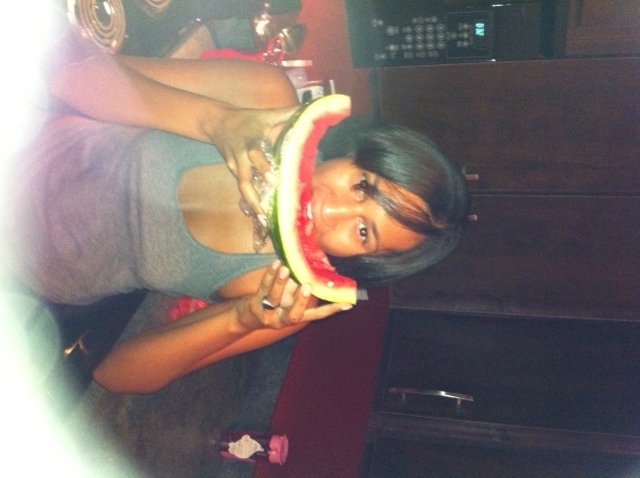 September 2012 – About an inch past chin length! Well, this idea came to me about an hour ago. I thought “hmm … I should do a moisture-rich co-wash day” and so I did. Normally I like to plan for my Wash Days, as it eliminates me having to think up what I am going to do on the spot … but I was like “what the heck … lego!” The main purpose of my Co-Wash Day was to infuse maximum moisture into my hair. This past Tuesday, I did my KeraPro Restorative Treatment, so I think my hair has enough protein in it for a while. I wanted to focus this day on PURE MOISTURE! I co-washed with my Alberto V-05 Strawberries and Cream (and yes, I know it says “protein” on the bottle, but I think this stuff is more moisturizing than protein-heavy). I followed that by my Alterna Winter Rx Thermal Oil treatment for about 5 minutes. I rinsed it out then applied Alterna Caviar Moisture from root to tip, leaving it on for about a minute, then rinsed it out. 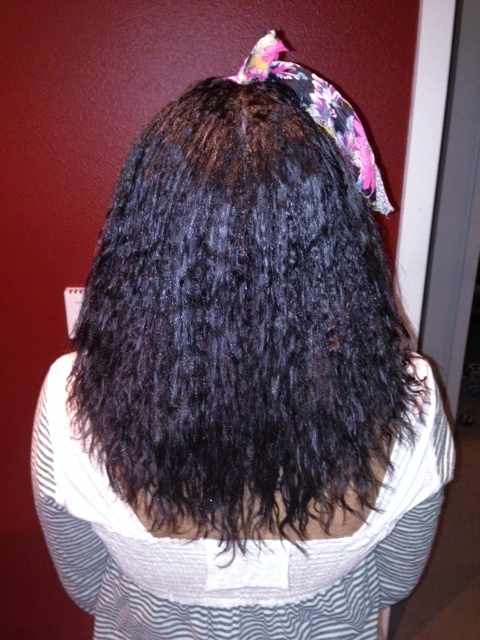 I used the Ion Extreme Moisture Cream as my shower deep conditioner. I applied it, tied my hair up with a turban and did my showering thing, then rinsed. After I was finished with the shower portion, I applied my Silk Elements MegaSilk conditioner and some vegetable glycerin, focusing heavily on my ends. I tied my hair up with the wet turban, applied a shower cap and plunked myself under my hooded dryer for about 90 minutes (which has been missing on the past few Wash Days). I really like it! I think that the results are wonderful! My hair feels uber moisturized! I don’t really manipulate my hair while it is drying (some girls say to straighten it every 20-30 minutes with your hands so that it dries straighter), so it dries in this wavy pattern. I don’t mind the wavy pattern, as gives my fine hair some volume. I will definitely be doing this again in the near future! My next Wash Day will probably be Monday (the anniversary of my first failed roller set!). I plan on pre-pooing, washing, deep conditioning and sitting under the dryer to let my hair dry. I previously mentioned in a post that I M&S my hair in quadrants. 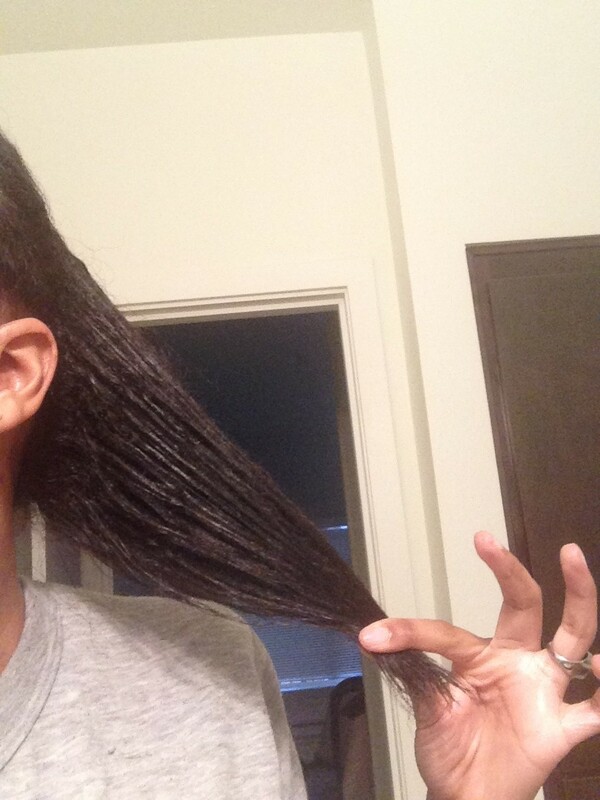 I think that this method allows for me to assess the state of each section of my hair by checking for excess shedding and breakage and by ensuring that each strand gets optimal moisture. Well, for a while now, I have noticed that I have one part of my hair that is thinner, has the more breakage and is just all-around in worse shape that the other parts of my hair. That part is located in the back of my right side (see my lovely drawing below). This area is constantly the bane of my HHJ. Sometimes I cringe when having to M&S that area because I know it will yield bad results. 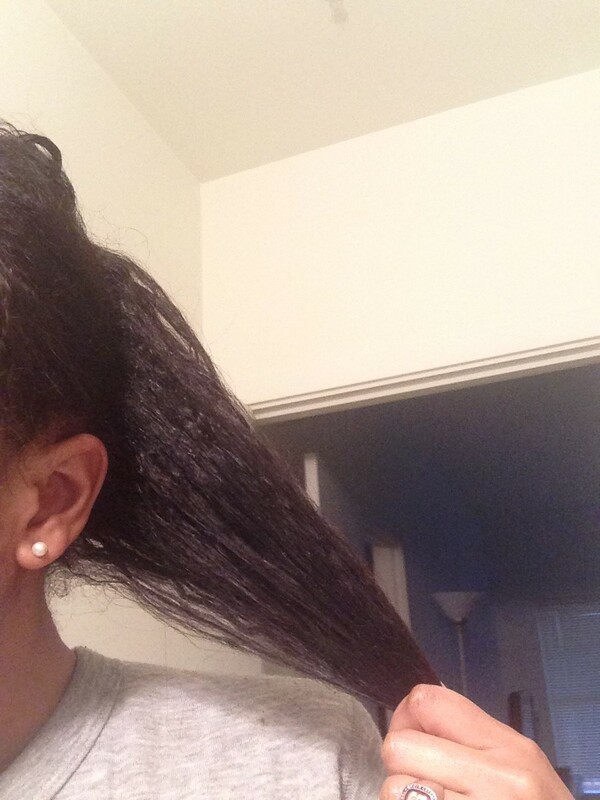 The need to dust often stems from this area, since when I am experiencing excess breakage (what I define as more than 5 ends over a period of a few days), I know its time to dust. Also this section sheds the most during my excessive shedding phases, which is why this section feels significantly thinner compared to its neighbor on the left side. I definitely do not show preferential treatment for certain quadrants of my hair, so I am not sure why this is to be the case. I am literally stumped! I wonder if it was years of my hair being wrapped to the right (mind you, my hair has been wrapped like that overnight maybe 5-6 times over the past year). Well, the only remedies that I can think of are to show this section a little more TLC when M&Sing and deep conditioning and see where this continued journey takes us. It’s not like the section doesn’t grow or even breaks to the point where there is a visible disparity in the length from my right side to my left side, but nevertheless, its noticeable to me and I would like it to stop! Update on 2/2/2013: Today I M&Sed the problem area of my hair by dividing it into two sections to see where the most breakage is coming from. I saw where the problem lies in the top part of the area, not the bottom, which affects length (which may explain why I do not see the disparity in length at my hemline despite that area being having more breakage than my left side). I will be continuing to monitor my hair by M&Sing like this for the near future. Greetings! As you may know, I am rocking air dried hair at the moment. What that means for me is that I am able to adopt a new M&S routine to increase moisture retention in my hair. 1. 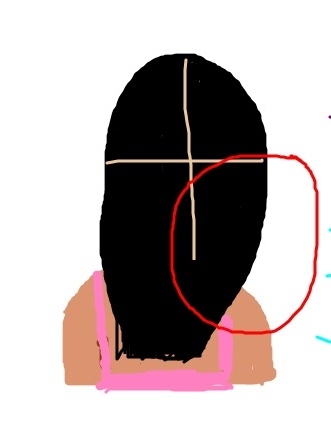 Part hair in quadrants. I M&S my hair in quadrants 90% of the time. 2. On each part, spray about 3 or 4 pumps of refreshing spritz (distilled water, rose water, hint of vegetable glycerin and a few drops of peppermint oil), focusing most on the ends and demarcation line. Rub through length of hair. 3. Spray 2 pumps of Alterna Caviar White Truffle Elixir. Rub through length of hair. 5. Repeat for each remaining quadrant. 6. Let hair air dry. 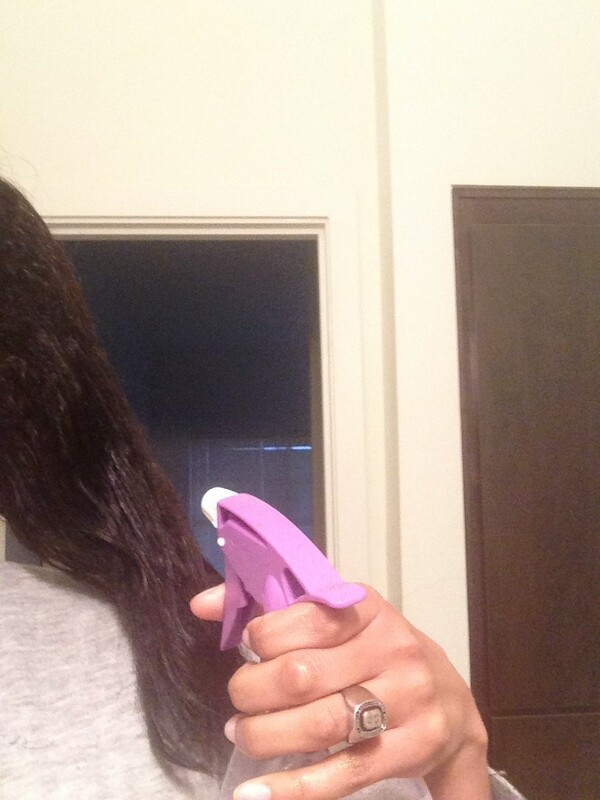 The point of this is not to get hair soaking wet, but to let hair get damp and seal the water in with the heavy oil. I must say, I notice less broken ends now that I am doing this routine! My hair definitely feels like it holds in more moisture. Well, I am 95% sure that I will be going home in February. I have a work trip to Atlanta, so I will just piggyback a quick trip to NC on it. 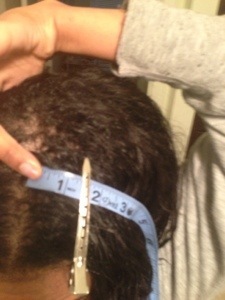 With that said, I will get a relaxer in about 5 weeks on February 21st, when I am 14 weeks post. I am definitely not a fan of long relaxer stretches (the longest I did was 16 weeks early last year), so I will just have to make it work! I will be using the Mizani Butter Blends, which I will have shipped to my mom early February! I checked my new growth yesterday and I have a decent amount overall. It is well over an inch in most places and in some parts in the front, I have measured 1.5 inches. I will take few pictures and post them! The heat break is still in full effect! 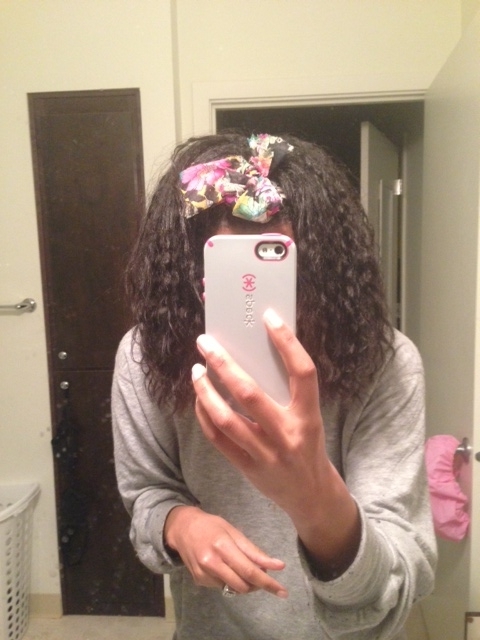 It has been almost 4 weeks since I have used direct heat on my hair (the blow dry and flat iron session). I do not foresee me using heat until the wash day before my relaxer. 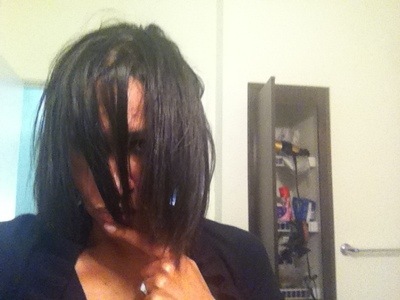 I plan on roller setting that week so that the new growth is more apparent that me just having wavy air-dried hair. 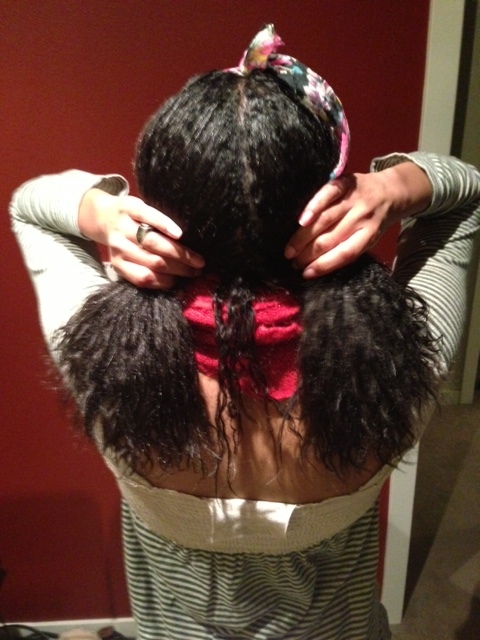 It also will make it easier for my hair to be parted instead of appearing that it is dreaded together! I am looking forward to my relaxer day … even though I am pretty sure I won’t be BSL … I feel like I will be pretty close to grazing it! Well, ta ta for now! I wasn’t sure how I was going to style my hair today. Sometimes despite my best intentions, my hair under the bonnet does not do well overnight, as it sometimes gets bunched up. When I took off the bonnet this morning, I thought that it would be the case. I shook my hair out and applied some kukui nut oil from root to tip to smooth the hair down. It worked so I decided to wear the half up, half down style. I must say … I am pleased with how it looks! I am sure that it will look a little rough once I hit the gym, but for now, it works! Wash Day and a Proclamation: I am chasing BSL!